Usuba is a traditional Japanese knife shape with a thick spine and pronounced shinogi line. Characterized by their rectangular shape and utter lack of camber Usuba knives are best used when preparing vegetables. The shape of the Usuba blade and the angle at which the handle is affixed to it allow for a significant degree of knuckle clearance which can be quite helpful when working with larger quantities. It is important to note that Usubas are typically one sided although this definition is not universally applicable and some manufacturers do create double-beveled knives that would indeed qualify as Usubas. The Echizen 1310 Series 6.7 in. (170mm) Nakiri is nicely weighted, making it ideal for unrolling cucumbers and great for vegetable preparation. Really smooth light feel with a bit more heft to the spine than other Echizen 1310 knives. The Glestain 5.1 in. 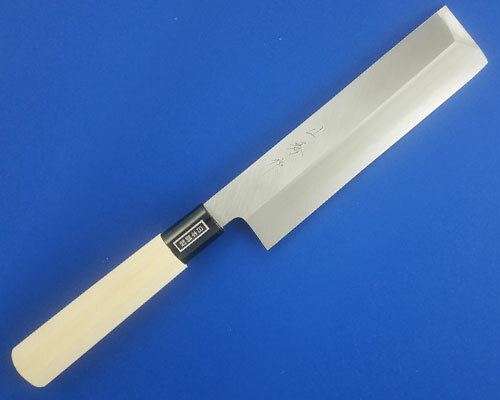 (130mm) Usuba provides for very clean, straight cuts and is used by sushi chefs to roll-cut cucumbers into very long thin sheets. G Series 7.1 in. (180mm) Usuba with a Granton Edge. 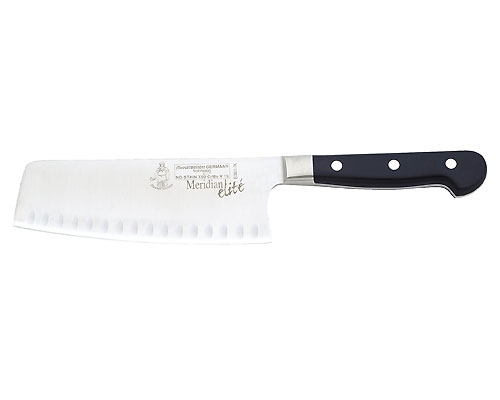 Chop vegetables without worrying about the vegetable sticking to the blade. Global GF Series 7.9 in. 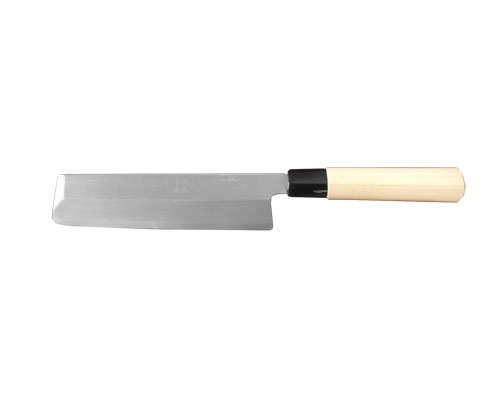 (200mm) Usuba is a heavy duty, drop forged knife for general preparation. Favored by Professionals. The I.O. 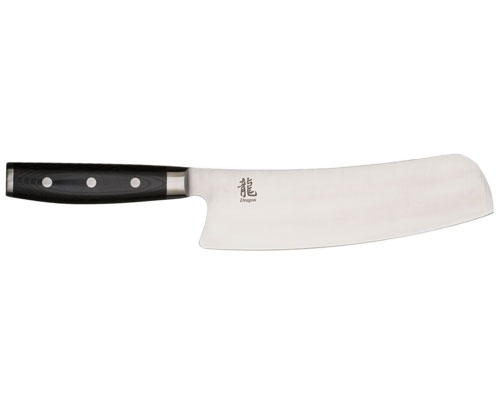 Shen 6.5 in (165mm) Nakiri is a standout vegetable prepping knife. 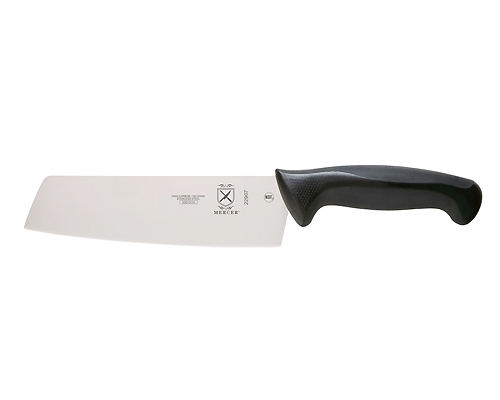 The large, weighted handle allows you to chop and mince for hours with comfort and the Triplex Steel blend has 62 Rockwell hardness that tapers down to a razor edge. Kikuichi Hammered Damascus 6.7 in. 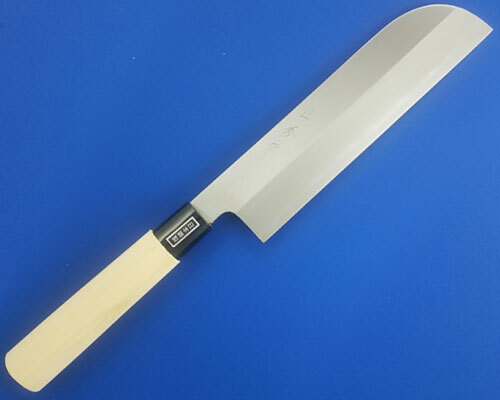 (170mm) Nakiri or vegetable knife has a very flat camber to the blade's edge use this for precise vegetable work such as unraveling cucumber, julienne cuts or mincing. The Kikuichi Nickel Damascus 6.9 in. 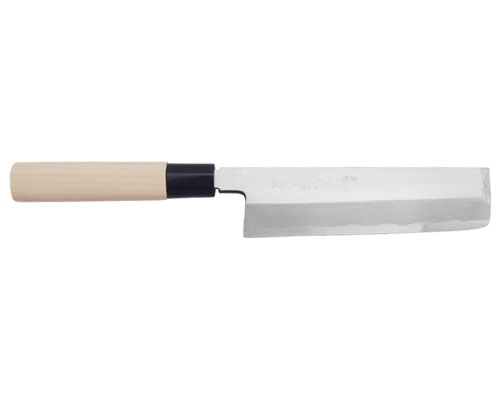 (175mm) Nakiri will quickly become your favorite knife to use when chopping up vegetables. This lightweight, traditional Japanese knife features a beautiful rosewood handle. 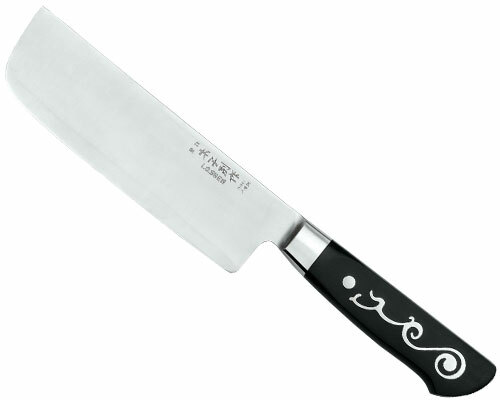 Revolution series from Kyocera has a thicker blade and is stronger than the Classic series. It also comes with an ergonomic handle. Nakiri is specifically for vegetables. Can be used for chopping, slicing and mincing. The blade is white with a black handle. Mac Professional 6.5 in. 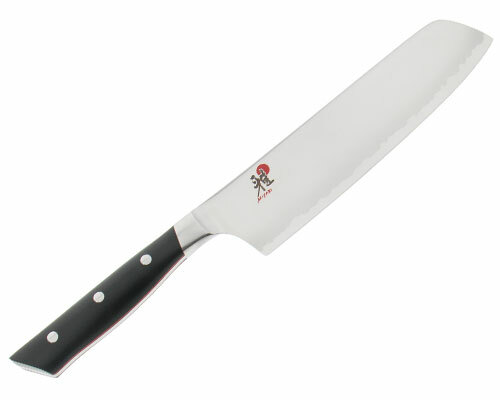 (165mm) Nakiri is ideal for peeling, slicing, dicing, and mincing. The Masahiro Carbon 6.5 in. (165mm) Nakiri provides for very clean, straight cuts and is used by sushi chefs to roll-cut cucumbers into very long thin sheets. 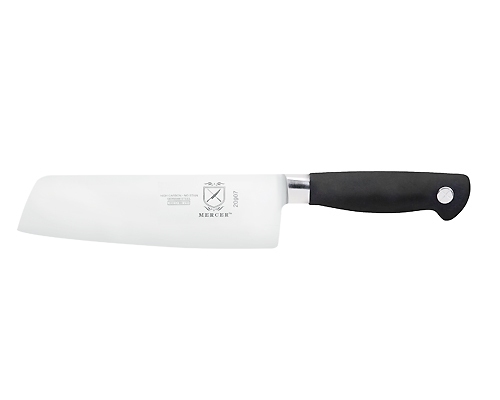 This knife is ideal for cutting, chopping and mincing fruits and vegetables. The Masahiro MV 6.5 in. (165mm) Nakiri provides for very clean, straight cuts and is used by sushi chefs to roll-cut cucumbers into very long thin sheets. 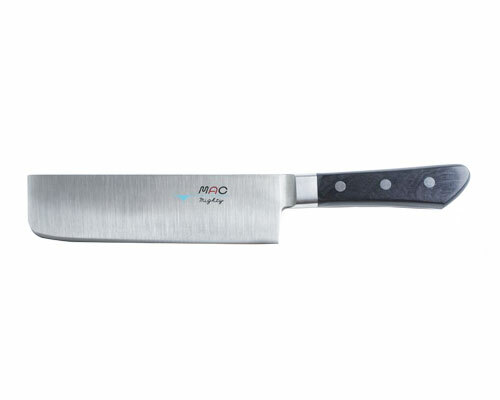 This knife is ideal for cutting, chopping and mincing fruits and vegetables. 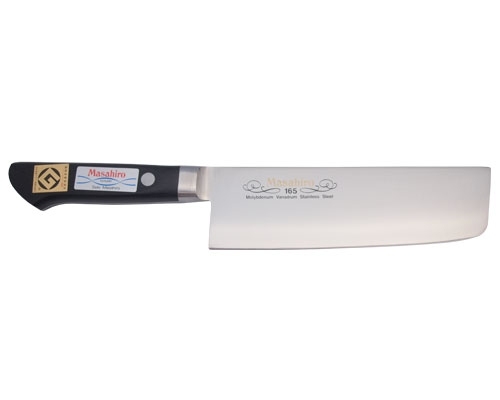 Also known as nakiri, this Asian-style knife with a classic rectangular shape is designed to quickly slice produce paper-thin. Mercer Genesis 7 in. HE Usuba is also known as nakiri, this Asian-style knife with a classic rectangular shape is designed to quickly slice produce paper-thin. 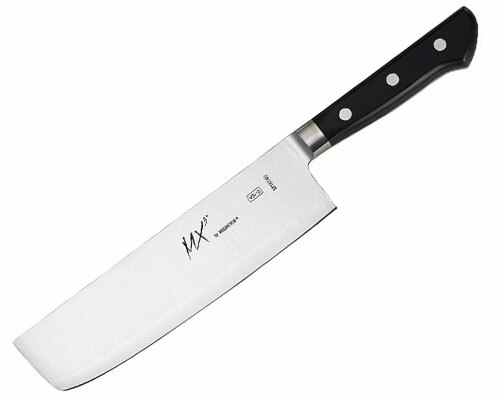 The hollow edge is to help relieve the food sticking to the blade. Stamped high carbon stainless steel that is razor sharp and easy to maintain. Ergonomic Santoprene Polypropylene mix handle for rigorous use with textured fingertips to provide non-slip grip. These are NSF certified. 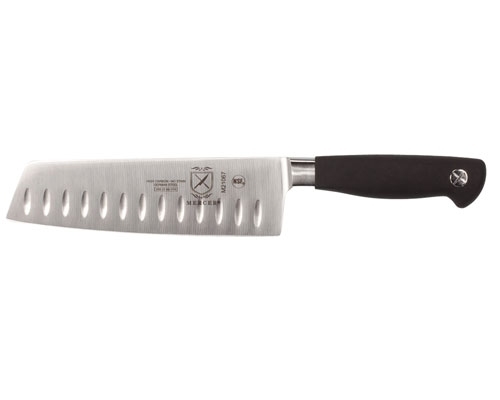 This Asian inspired vegetable knife, also called a nakiri, combines the classic features of a European chef’s knife with the wide blade style preferred by chefs from the Far East. The Minonokuni Ginsan 7.1 (180mm) Kama-Usuba is hand forged by master Minonokuni craftsmen using traditional knife making techniques. This Kasumi knife uses unique Ginsan steel and is jacketed by a softer (SUS405) Steel. This Kasumi process allows for such a hard Ginsan steel to be hammered out in a traditional method to a single sided edge. This knife features a burnt Chestnut wood handle and a Buffalo horn ferrule. A fitted Saya is included with this Minonokuni. The Minonokuni Ginsan 8.3 (210mm) Kama-Usuba is hand forged by master Minonokuni craftsmen using traditional knife making techniques. This Kasumi knife uses unique Ginsan steel and is jacketed by a softer (SUS405) Steel. This Kasumi process allows for such a hard Ginsan steel to be hammered out in a traditional method to a single sided edge. This knife features a burnt Chestnut wood handle and a Buffalo horn ferrule. A fitted Saya is included with this Minonokuni. Usuba is a one sided, hand forged, pure carbon vegetable knife. 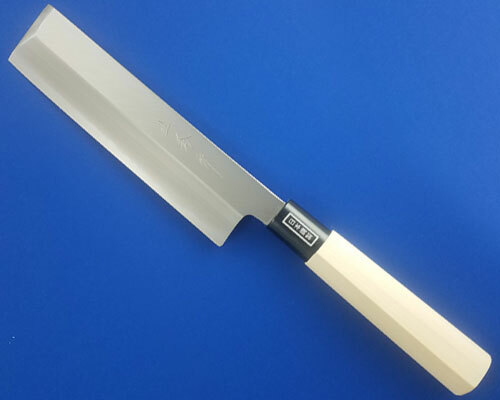 This Usuba provides for very clean, straight cuts and is used by sushi chefs to roll-cut cucumbers into very long thin sheets. This knife is ideal for cutting, chopping and mincing fruits and vegetables. The Minonokuni Sakura 8.3 in. (210mm) Usuba is a Kasumi style(two steel) traditionally forged knife using a Blue steel as the blade steel and a Damascus steel as the Jacket. These Damascus knives are made by the top blacksmiths of Minonokuni; the Usuba is known for its wide shinogi-line and very thin edge making it the best knife when doing precise vegetable work such as a rotary peeling technique. The Blue steel used in this knife is prized for its edge retention properties, the handles on these Sakura knives are long and comfortable hexagonal shape handle made of red sandalwood, the ferrules are made of a black laminated wood. The kamagata usuba is used as a vegetable knife. Lighter than a traditional usuba and with a sharp point, the kama-usuba shape is more popular in Japan than the traditional usuba. Meant for use on left hand. The kamagata usuba is used as a vegetable knife. Lighter than a traditional usuba and with a sharp point, the kama-usuba shape is more popular in Japan than the traditional usuba. 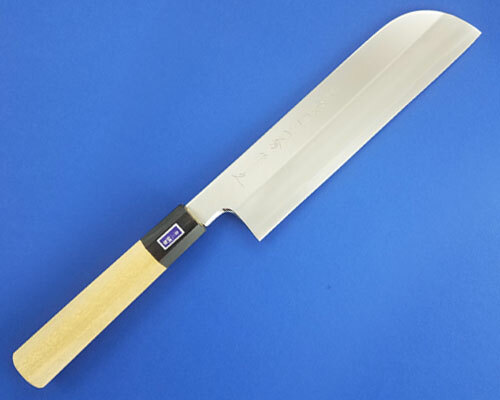 Také 180mm Usuba is a vegetable knife used for making extremely precise cuts with clean lines. 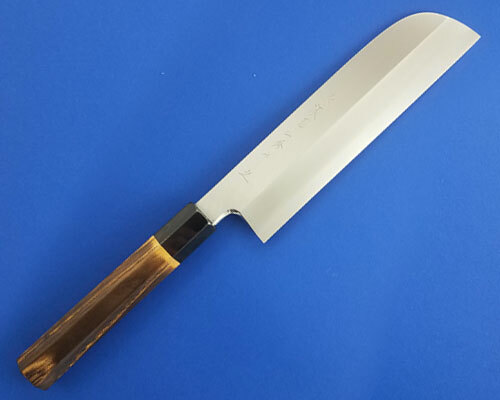 Také 210 mm (8.2 in) Kamagata Usuba is a Japanese all-purpose vegetable knife. 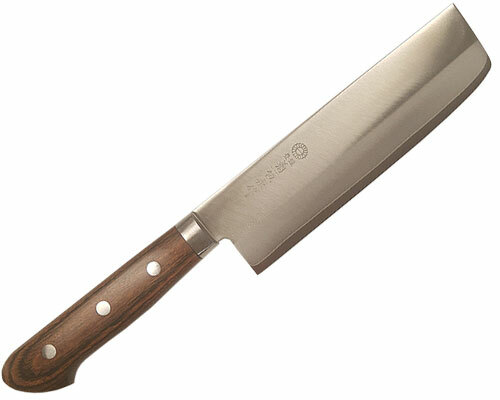 Také 210 mm (8.25 in) Usuba is a Japanese all-purpose vegetable knife . The 180mm Left Handed Ume Usuba is a one sided, hand forged, pure carbon vegetable knife. 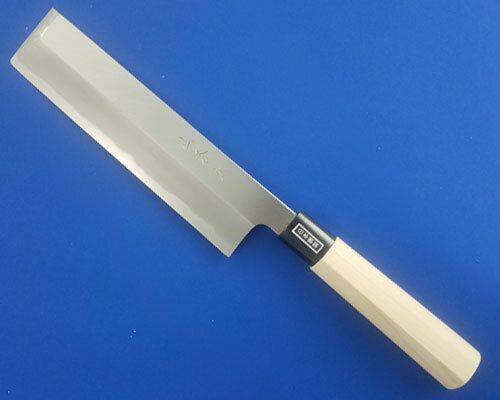 This Usuba provides for very clean, straight cuts and is used by sushi chefs to roll-cut cucumbers into very long thin sheets. 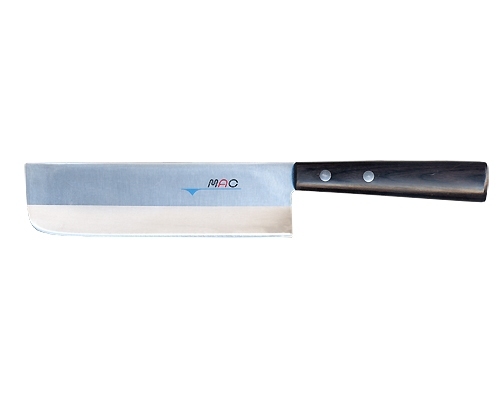 This knife is ideal for cutting, chopping and mincing fruits and vegetables. The 180mm (7 in) Ume Kama-Usuba is a one sided, hand forged, pure carbon vegetable knife. The kamagata usuba is used as a vegetable knife. Lighter than a traditional usuba and with a sharp point, the kama-usuba shape is more popular in Japan than the traditional usuba. The 180mm Ume Usuba is a one sided, hand forged, pure carbon vegetable knife. 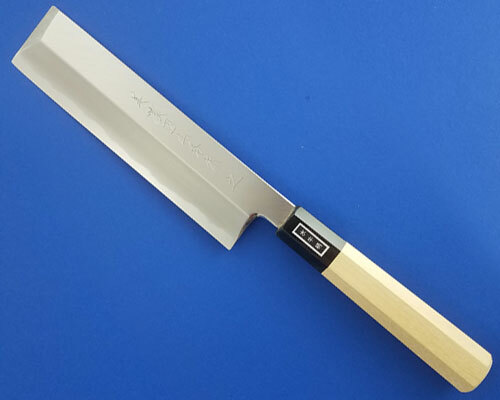 This Usuba provides for very clean, straight cuts and is used by sushi chefs to roll-cut cucumbers into very long thin sheets. 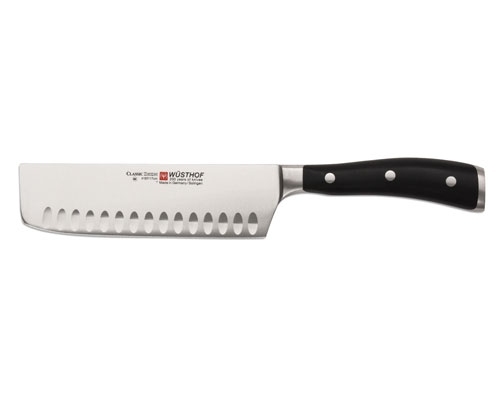 This knife is ideal for cutting, chopping and mincing fruits and vegetables. The 210mm (8.25 in) Ume Kama-Usuba is a one sided, hand forged, pure carbon vegetable knife. The kamagata usuba is used as a vegetable knife. Lighter than a traditional usuba and with a sharp point, the kama-usuba shape is more popular in Japan than the traditional usuba. 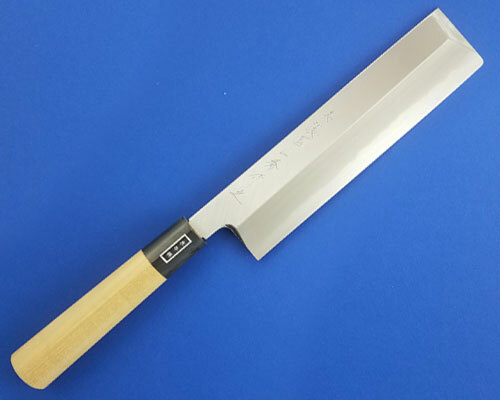 The 210mm (8.25 in) LEFT handed Ume 210 mm (8.3 in) Usuba is a one sided, hand forged, pure carbon vegetable knife. 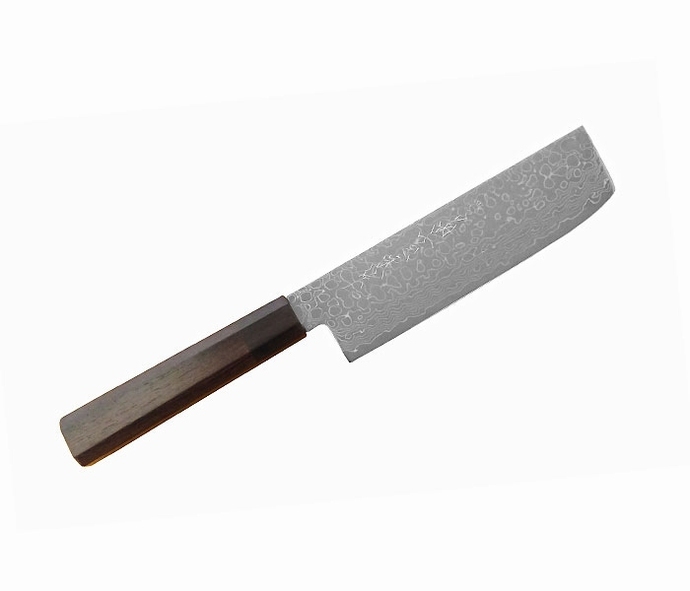 Usuba is the perfect vegetable knife, the shape is very utilitarian and some chefs will use this for 90 percent of their work. Broad blade makes it easy to control. 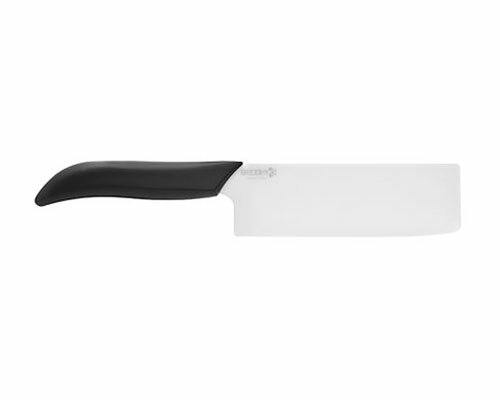 Good for cutting, smashing garlic and lifting cut veggies from the cutting board to the pan. The 210mm (8.25 in) Ume Usuba is a one sided, hand forged, pure carbon vegetable knife. 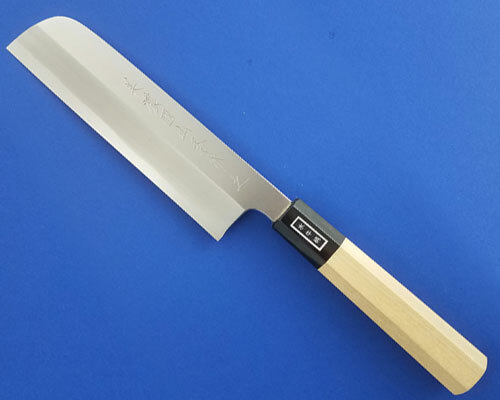 Usuba is the perfect vegetable knife, the shape is very utilitarian and some chefs will use this for 90 percent of their work. Broad blade makes it easy to control. Good for cutting, smashing garlic and lifting cut veggies from the cutting board to the pan. The Shun Classic 6.5 in. (165mm) Nakiri Vegetable Knife is used for cutting vegetables, and isn't used like a chef's knife. Best used when preparing salad and stir-fry. 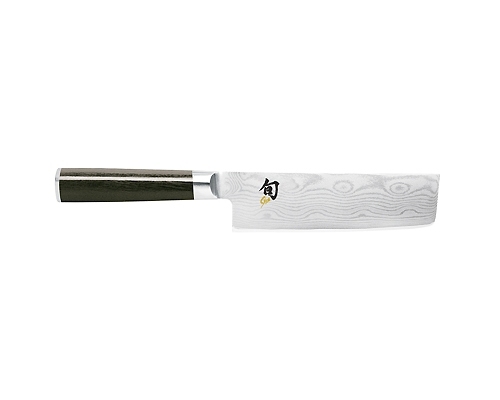 The Shun Kanso 6.5 in. 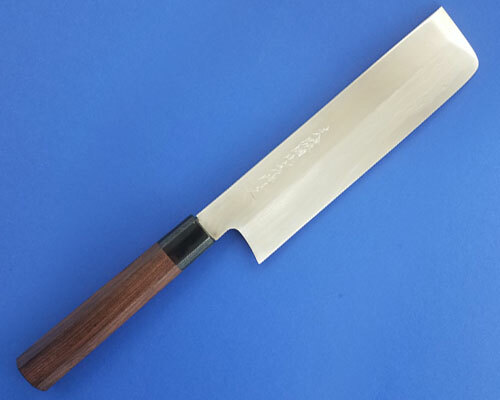 HG Nakiri is made of Japanese AUS10 Steel and a Tagayasan wooden handle. This "vegetable" knife is meant for high usage fruit and vegetable prep. 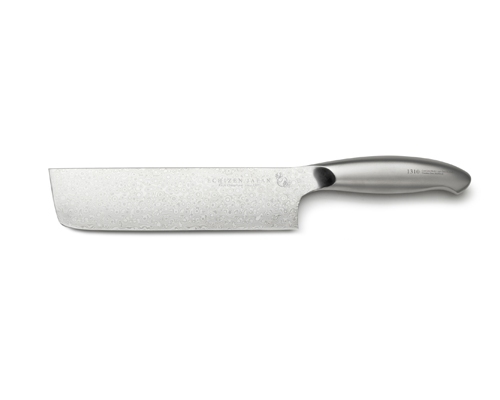 A push cut is the ideal way to use this knife and the dimpled edge keeps your fruits and veggies from sticking to the blade. 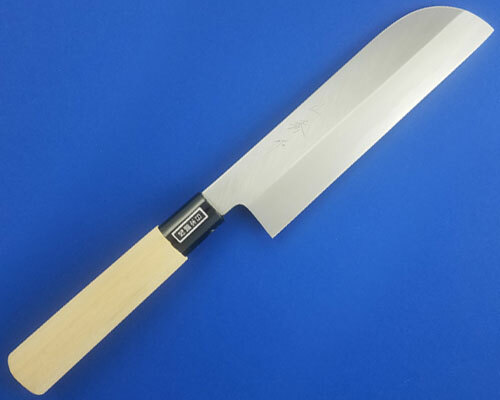 Shun Kanso 7 in. 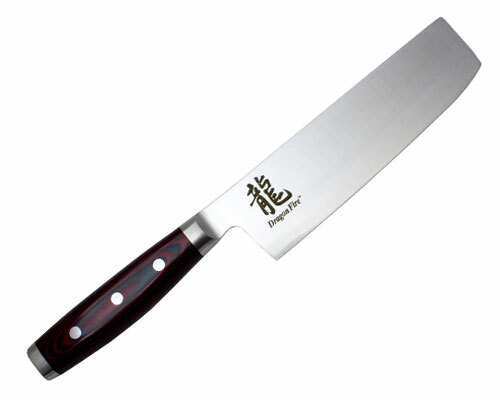 Asian Utility Knife is used for chopping and dicing vegetables. Can also be used to smash garlic. Shun Kanso is Japanese AUS10A refined, high carbon vanadium stainless steel with a razor sharp 16 degree 2 sided edge. The Heritage finish is designed to hide scratches and will patina over time to further complete the vintage look. It’s completed with a Tagayasan Wood handle riveted on a full tang blade. The Shun Premier 5.5 in. 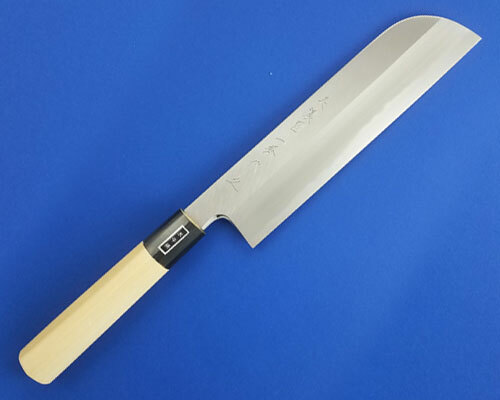 (140mm) Nakiri has chefs and cooking enthusiasts around the world talking about this beautiful and extremely useful tool whenever they have quantities of fruits or vegetables to chop, slice, or dice. 2.75 in. x 7 in. The Wusthof Classic 7 in. Granton Edge Chai Dao has several very unique features. The overall shape is similar to a Chinese cleaver and can be used in the same manner for breaking down chickens, or slicing and dicing vegetables. 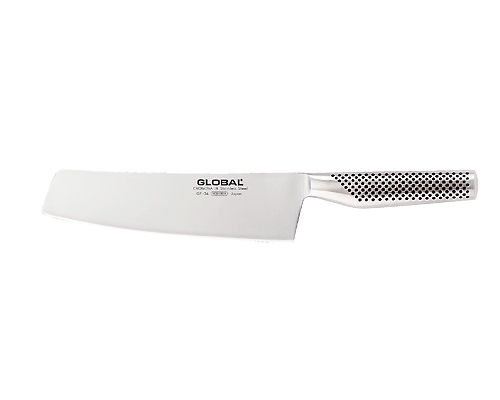 The granton edge provides pockets of air to prevent food from sticking to the blade. The edge of the blade has a camber or rounded design, so it can also be used in a rocking motion for vegetables and particularly for mincing herbs. The pointed tip is my favorite feature and I use it for things like making the lengthwise cuts on celery before dicing. The width of the blade is also useful for smashing garlic and lifting cut vegetables from the cutting board and transferring to a bowl or pan. - The blade shape finds its origin in Japan. 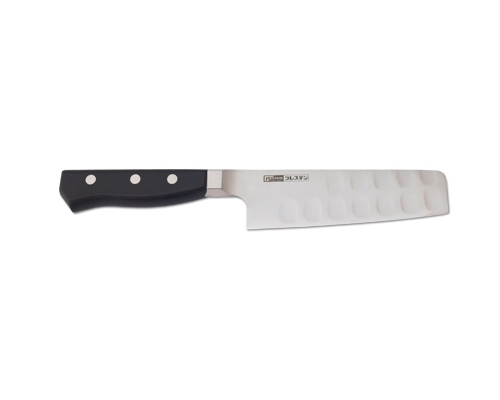 A versatile vegetable cleaver for slicing, dicing and chopping even large vegetables. Thanks to the thin and wide blade it produces very fine and even cuts. - And like all WUSTHOF knives the sharpness of the Nakiri can be easily maintained by using one of the WUSTHOF draw sharpeners. 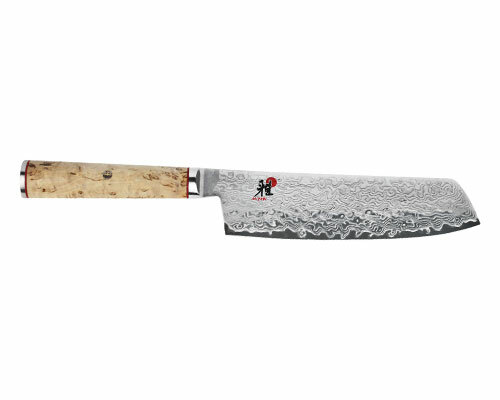 The Yaxell Dragon 8.5 in Nakiri is made of sharp and durable CTS-BD1N nitrogen steel. This new-age steel has a Rockwell hardness of 63HRC meaning it can retain an edge for much longer than other steels. At 8 inches in length, this is longer and heavier than any other Nakiri. The most enthusiastic feedback we've received on this blade has come from prep cooks doing large volumes of work, who have enjoyed working with this design. The Yaxell Dragon Fire 7 in. 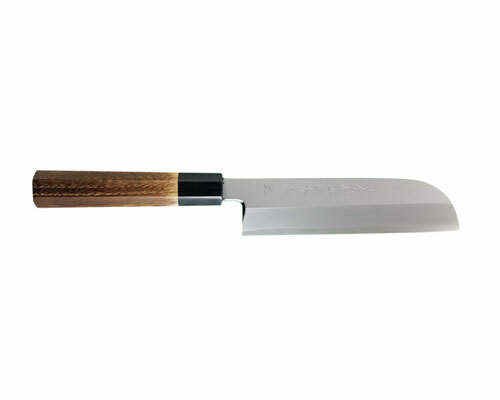 Nakiri is an excellent choice for the avid vegetable prepper. 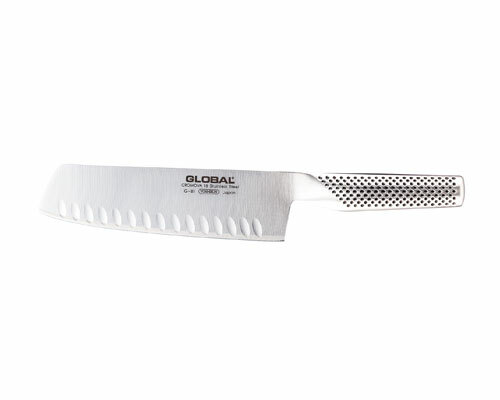 Great for chopping, dicing, mincing and smashing garlic; this knife will hold its edge like a champion without sacrificing the delicacies of traditional Japanese steel. 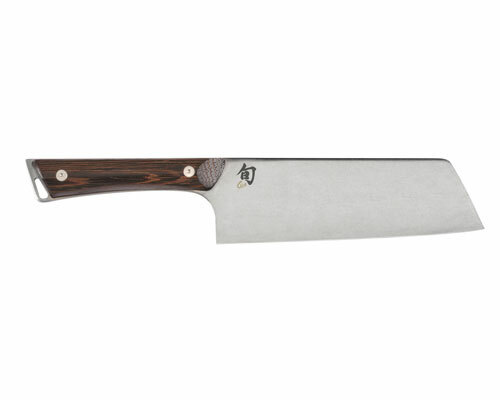 The BD1N steel used in this knife is a highly refined nitrogen-enriched American steel. The handle is made of FDA approved red resin and linen Canvas Micarta with three stainless steel rivets. The canvas material is dyed red and brilliantly finished to last for decades.